Black Button Distilling partners annually with the New York Wine and Culinary Center to create a garden inspired gin. Just like Black Button’s other work, Garden Gin is grain-to-glass. It’s distilled from Local Wheat, similar to Black Button’s 20-Plate Vodka. The nose of Garden Gin is perhaps a bit more spicy than immediately garden-like. Malty, bright warmth, bitter orange rind, a hint of anise, with heady cardamom and spice— lots of spice. But the palate of Garden Gin is where you taste much more of the herbal garden notes. First impressions are that there’s a nice herbal, grassy note. Mint, menthol and licorice all present early. Then Black Button Distilling’s Garden Gin becomes a bit more “chewy.” Notes of thyme, shiso leaf and a sage-like camphoraceous echo. Especially towards the finish there’s green, fir-like notes. It begins to remind me of New Columbia Distilling’s Ginavit. Garden Gin is perhaps it’s most garden-like in a Gin and Tonic. Notes of celery seed, licorice root and rich herbaceous juniper come through. It’s also a good option for pairing with honey in a drink such as The Bee’s Knees or citrus like the Tom Collins. I’d also suggest this gin in a Martini. Garnish with an olive is a must. It’s a great option for fans of Gin Mare. And an ideal candidate for an up-market Dirty Martini. Fans of herbal and spice-forward contemporary style gins will likely find a lot to like about Black Button’s partnership here. Although the nose betrays the gin’s spicy side, the palate brings the garden with just enough juniper to balance things out. Furthermore, the wheat spirit base adds a nice warmth and texture. 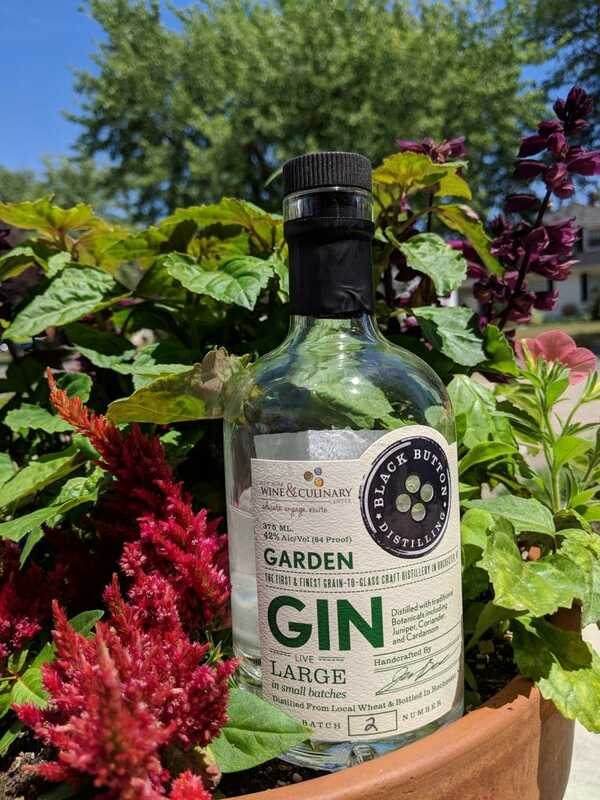 Garden Gin is another exceptional product from Rochester’s Black Button Distilling. I’d easily recommend this product to anyone looking for a spirit that embodies the flavor of the summer season.